I've been looking for something to nosh on while playing World of Warcraft. It's akin to eating while watching a movie or TV. Right hand on the mouse and left hand occasionally pushing buttons or reaching for tea or a snack. The usual accompaniments, chips, crackers, candy, aren't the best for me so I was scratching my head for something better. And then I drove to Ohio. At the Tiffin River rest stop, I picked up a package of trail mix. Bingo! I can make this, in large quantities, at home and add those things I want to eat. Viola. My first batch. We called it "gorp" when I was growing up. 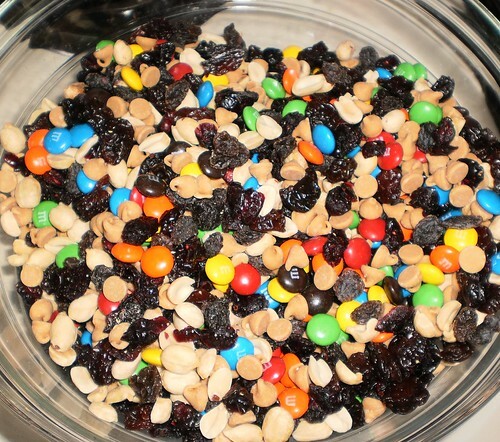 If you google that word, you'll see it is just another name for trail mix and possibly is an acronym for "good ol' raisins and peanuts" which hikers would carry for a snack. This concoction is really, really good. I should have bagged it in one cup amounts. Instead, I just grabbed a bowl full and kept it by the computer for the weekend. Yeah. Even healthy food isn't good for you eaten in mass quantities. The rest of the raisins in the container. The rest of the jar of unsalted peanuts. I really wanted sunflower seeds but no one, not even the manager of the Domincks where I shopped, could find the sunflower seeds. Having eaten a goodly amount of this, I don't think sunflower seeds would have added to it. Plus, being much smaller than the other items in the gorp, they would have been messier to eat. I'm going to be making some more Chex mix this week, but I think I have a winner in this recipe.